The gentle sound of falling water pervades the air at Villa Atacaya. Fountains, fishponds and a holy spring gush forth and combine with a spectacular jungle setting – one filled with towering trees, tall palms and tropical plants and flowers – to create a serene and natural idyllic holiday retreat. 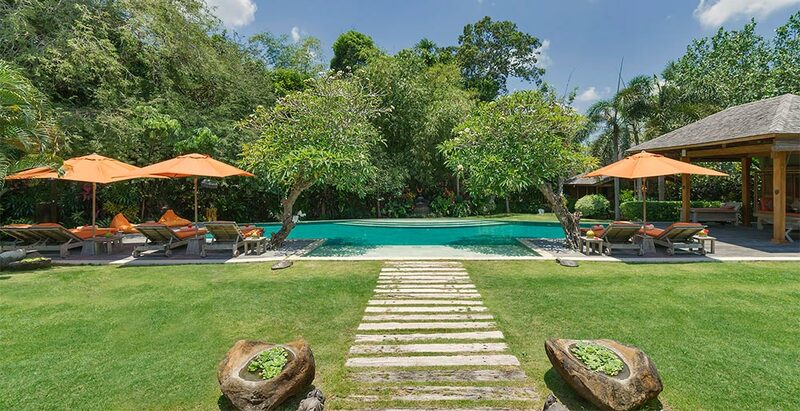 Only 13 kilometres from the buzz of Seminyak, Villa Atacaya is built into the bank of the heavily forested Yeh Penet River, offering gorgeous valley views. 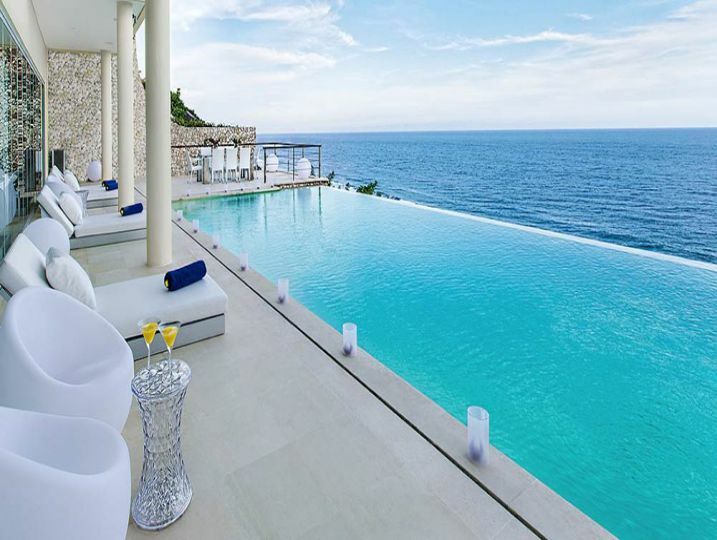 The contemporary styled villa is built over three levels with a garden courtyard as its centrepiece and a 15-metre infinity-edged swimming pool at its border. The two-storey main building has dining and sitting areas on both levels providing a choice of formal or informal, outdoor and indoor, settings. There’s also bar and an air-conditioned TV room opening onto the gardens and pool , Four bedrooms, each with stylish ensuite bathrooms, fill the other pavilions and down at riverbank level is a fifth bedroom, a yoga deck and a bale bengong relaxation pavilion. Villa Atacaya is staffed by a manager and a competent team of butlers who will go out of their way to make sure every guest’s need is taken care of, while the in-house chef will whip up any number of creations to satisfy all ages and tastes. A car and driver is available for up to eight hours a day at a special rate, to whisk you off for a night on the town or visit the picturesque Tanah Lot sea temple. Mary’s Beach Villa elegant villa provides all the comforts and glamour of modern tropical living while preserving a distinctive Balinese charm in an exotic atmosphere. Beautiful Ocean views of good surfing breaks which extend down to Kuta and the Bukit. Villa in Bali, Canggu is perfectly situated 50 metres from the beach on Jalan Nelayan, renowned for its world-class surf breaks in outskirt Canggu area. Only 45 minutes from Bali’s international airport while the appealing Seminyak, famous for its boutiques, International-acclaimed restaurants and nightlife is accessible within 20 minutes drive. Mary’s Beach Villa in Canggu, Bali 4 bedrooms villa is designed by one of Bali’s premier architects, Komang Suardika Jeghier of Jeghier Architect. The result is a signature of creation with a unique layout and beautiful roof design. The Architect’s freedom of expression stands out throughout the villa & surrounding grounds. Under Mary beach villa tria luxury beachfront villa owns unique roof, this is the ultimate chill out zone. Indulge yourself with your favorite drink, relax with a good book or have the staff arrange for breakfast, the view overlooking the ocean & garden is outstanding. If you are keen on surfing this is the perfect vantage point to check out the waves. Over 700m2 of manicured landscaped gardens with exotic tropical palms plants & flowers. Lime, Mango, Bananas, Green & yellow Coconut and Sawo fruit trees & palms are flourishing & free to guests when in season. Garden/ perimeter soft lighting controlled by staff. Large pool with 6 sun lounges & separate poolside bale. There’s also a 6 piece outdoor setting on the decking for those poolside sessions. Main Living Area (Semi open-air living area, Air-conditioning, Television & DVD player, HiFi sound system). Bedroom 1 (Ensuite bathroom with bathtub, King size bed, Air-conditioning & ceiling fan, Television with DVD player, HiFi sound system, Music docking station, Living Room, Wardrobe with safety deposit box, Terrace outside bedroom with sofa). Bedroom 2 (Ensuite bathroom with bathtub, Single size bed x 2, Air-conditioning & ceiling fan, Television with DVD player, HiFi sound system, Music docking station, Walk-in robe with safety box). Bedroom 3 (Semi-outdoor ensuite bathroom with bathtub, King size bed, Air-conditioning & ceiling fan, Television with DVD player, HiFi sound system, Music docking station, Walk-in robe with safety box, Terrace outside bedroom). Bedroom 4 (Semi-outdoor ensuite bathroom with bathtub, King size bed, Air-conditioning & ceiling fan, Television with DVD player, HiFi sound system, Music docking station, Walk-in robe with safety box, Terrace outside bedroom). Kitchen and Dining (Semi open-air kitchen & dining area, Fully equipped kitchen, Cutlery, chinaware & glassware, Full-size refrigerator with ice cube maker, Dishwasher). Additional Living Area 1 (Lounge setting, HiFi sound system). Miscellaneous (Safety deposit box, Baby cot & high chair available – charges apply). Services Performed by Staff (Villa Manager, Cook, Driver, Housekeeper, Security, Swimming Pool Attendant, Garden Attendant). Property Outlook (Swimming pool views, Garden views, Partial sunset views). Airport transfer (arrival only), Welcome drink upon arrival, Breakfast (first morning only), Free Wi-Fi, Complimentary mini bar (first day only),Drinking Water, Coffee & tea, Housekeeping service daily. Towering above Uluwatu’s rolling green hills, the magnificent Indian Ocean, as well as the beach towns of Seminyak and Canggu in the far distance, Villa Puri Balangan boasts some of the most awe-inspiring panoramas on the island. This four-bedroom luxury clifftop haven in the Bukit is a fantastic rental home for a family or a group of friends looking for a quiet spot to explore this beautiful corner of Bali. Children in particular will love the vast hillside tropical garden that surrounds the property which – along with the large infinity pool – forms a perfect adventure playground. Villa Puri Balangan’s central location, breathtaking vistas and stunning outdoor areas offer a superb backdrop for a sumptuous wedding, anniversary or birthday celebration. Covered by a huge cathedral-like roof, its living areas are spacious and lovingly designed using only natural materials and colour patterns which carefully complement the emerald and turqoise skyscape. The master bedroom is nothing short of ‘palatial’ and has its own annex with two additional single beds – great if you have small children. The three ensuite guest bedrooms are also well-apportioned and – like the rest of the villa – will allow you to wake up to the most inspiring views. Meanwhile, Villa Puri Balangan’s contingent of helpful and professional staff will take care of your every need, allowing you to simply sit back and relax. Close to some of Bali’s most popular attractions – yet far enough from its main hubbub – Villa Puri Balangan is an incredible choice if you’re seeking space and tranquillity surrounded by stylish luxury – or indeed if you’re looking to dazzle guests at your next event. Villa Kedidi is the perfect Bali villa rental choice for families wishing to experience a taste of luxury at an affordable price. Just a short stroll from the glistening black shores of Canggu Beach on Bali’s southwest coast, this Canggu villa delightful three-bedroom villa with 10-metre swimming pool is cute and compact, oozing character and charm. Named after the sand piper that frequents the nearby shores, Villa Kedidi is one of Canggu villa only 100 metres from Canggu Beach on Bali’s south west coast. Resting quietly behind its own private walls next to sister Villa Kakatua, this three-bedroom haven is the quintessential Balinese home. Designed in traditional Bali-style, solid coconut beams support high serapwood ceilings that capture the tropical breeze and cool the open-sided living spaces. An enticing natural green-stone swimming pool sits strategically in the middle of the compound, promoting easy access from the surrounding bedrooms that feature beautifully carved wooden beds and semi-open garden bathrooms. The special Balinese ambiance is further enhanced by exquisite artefacts and antiquities that are found throughout the home and in the lush tropical gardens. Intricate carved limestone murals depict stories of times gone by, giving insights into the island’s diverse and fascinating culture. Perfect for families, this Bali villas for rent is fully equipped for children including high chairs and baby cots to pool fencing and swimming aids. The warm and friendly staff are excellent with children allowing parents to relax and unwind knowing the kids are in a safe and secure environment. for trips further afield. Villa Kedidi is definitely the ideal choice for those wishing to experience a taste of luxury at an affordable price. Villa Kedidi is accessed by a private path bordered by plants and limestone carvings that leads to its traditional Balinese doors. Behind these doors guests are greeted by an aling-aling wall (a short partition wall which, according to religion, protects the villa from bad spirits). With the bedrooms and living spaces built around the swimming pool, the villa is neat and compact; similar in composition to the traditional ‘compound’ design of most Balinese homes. All three air-conditioned bedrooms are similar in design with polished cream terrazzo floors, ceiling fans, beautifully carved wooden beds draped with mosquito nets and antique batik throws. Tastefully decorated with Javanese antiques and traditional paintings and portraits, the rooms are very homely and comfortable. iPod docks add a modern touch while the lovely garden bathrooms, dotted with bluestone pebbles and with open air showers, inject tropical style. 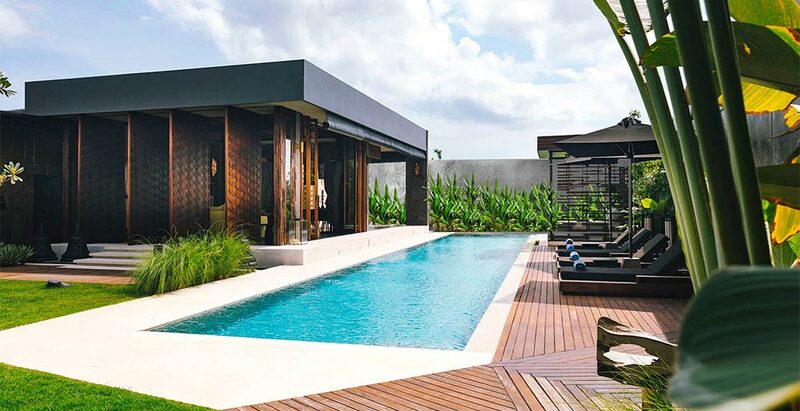 Situated an easy 20-minute walk from the beach in Canggu’s super trendy Batu Bolong area, Villa Kayajiwa’s edgy architecture, tasteful interior design, stunning 25-metre pool and purpose-built karaoke room make it a perfect spot for relaxing, hanging out and having fun. 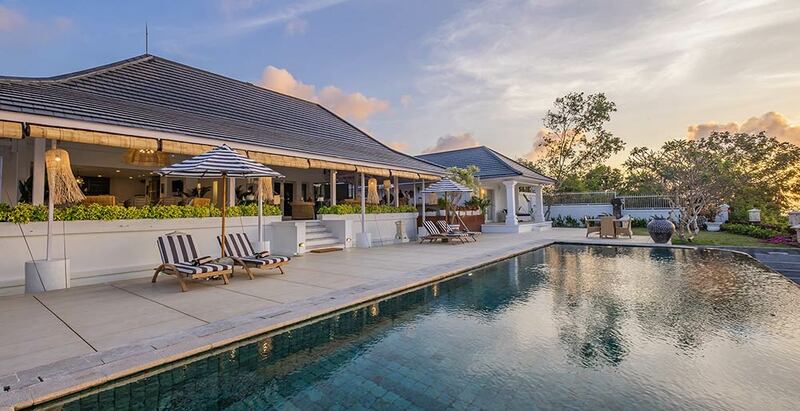 Built in an L-shape around the pool and tropical gardens overlooking the rice fields, this four-bedroom luxury villa in Canggu sits at the quiet end of Batu Bolong, the road that this area is named after. 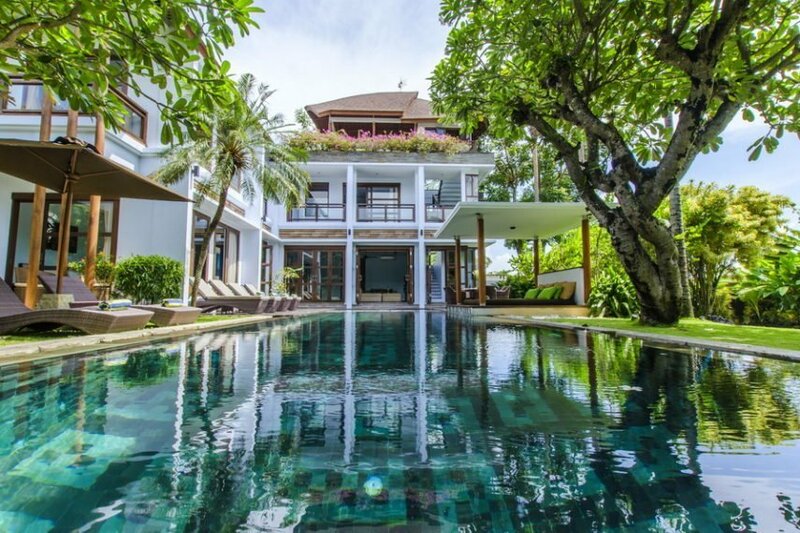 The element of water features strongly in the design of this villa – a moat between the inside and outside spaces creating a very relaxing ‘zen’ feel. And architectural style is contemporary chic and minimalist, with sharp lines and dramatic volcanic-stone finishes. Interiors are a fusion of Balinese art with splashes of colourful South East Asian influences, oozing style and ‘feng shui’ without ever being over the top. If you’re visiting with a bunch of friends or with children who enjoy a good sing-along, Kayajiwa is the perfect villa. You can sing to your heart’s content in the villa’s purpose-built karaoke room (which doubles up as a home cinema) without bothering the neighbours. If, however, you would prefer to get away from it all for some well-earned ‘me’ time, simply book a relaxing body treatment and head upstairs to the villa’s massage room. However you choose to spend your time, you will be ably looked after during your stay by the villa’s caring and professional team of staff, which includes a knowledgeable villa manager, housekeeping and service staff. There’s no shortage of things to do during a stay at Kayajiwa. 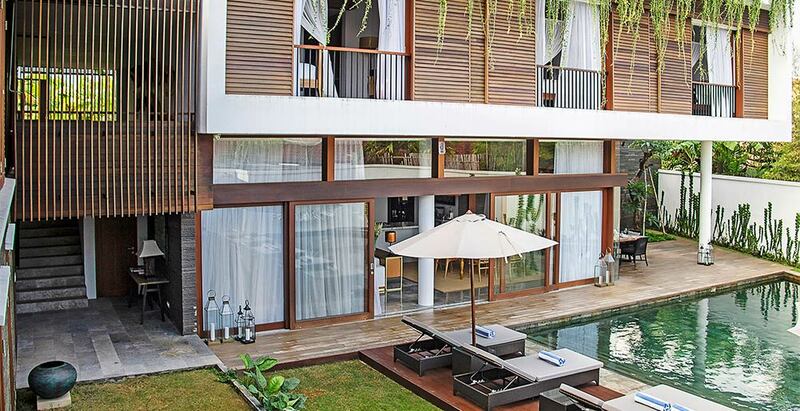 The villa sits at the heart of Bali’s rapidly growing eco-conscious and healthy living movement. During the day it has an incredible variety of juice bars, coffee shops and vegan eateries, while at night it becomes the Canggu hotspot for the young and fabulous. Everything is large-scale here: the towering studded ironwood entrance doors opening onto a procession of soaring palms; the expanse of polished concrete floors that flow through all the pavilions; the vast open sided spit-level living pavilion with its vaulted roof, oversized sofas and massive suarwood table – even the huge terracotta pots flanking the colonnaded walkway that links the three pavilions. And yet there’s intimacy in the layout, with rooms oriented around the 15m swimming pool, small courtyard gardens, and lots of private spots to escape for some peace and quiet. Kids will love their dedicated room with built-in bunk beds, the home theatre complete with PS2, and the pool toys. Parents will appreciate being able to keep an eye from the comfort of the living pavilion while soaking up the attentions of the staff, discreetly on hand to indulge every whim – including a fabulous chef at the ready to whip up everything from light lunches to gourmet meals. There’s an excellent, reasonably priced menu, and a choice of formal dining or semi-alfresco in the BBQ pergola. Villa Hana is perfect for families and groups of friends who like the idea of pampering and privacy just paces from the pounding ocean. What better way to round off a relaxing day watching surfers ride Echo Beach’s famed surf break while enjoying sunset drinks, knowing that Villa Hana’s chefs will have a gourmet meal waiting for you when you return home. Main Living Area (Semi open-air living area, Ceiling fan). Bedroom 1 (Ensuite bathroom with bathtub, King size bed, Air-conditioning, Television with international channels & DVD player, Toiletries, Walk-in robe with safety box, Terrace outside bedroom). Bedroom 2 (Ensuite bathroom, King size bed, Air-conditioning, Television with international channels & DVD player, Toiletries). Bedroom 3 (Ensuite bathroom, King size bed, Air-conditioning, Television with international channels & DVD player, Toiletries). Bedroom 4 (Purpose designed children’s bedroom, Children-size beds x 8, Air-conditioning, Television with international channels & DVD player, Toiletries, Terrace outside bedroom). Bedroom 5 (Purpose designed children’s bedroom, Children-size beds x 8, Air-conditioning, Television with international channels & DVD player, Toiletries, Terrace outside bedroom). Bedroom 6 (Purpose designed children’s bedroom, Children-size beds x 8, Air-conditioning, Television with international channels & DVD player, Toiletries, Terrace outside bedroom). Bedroom 7 (Purpose designed children’s bedroom, Children-size beds x 8, Air-conditioning, Television with international channels & DVD player, Toiletries, Terrace outside bedroom). Bedroom 8(Purpose designed children’s bedroom, Children-size beds x 8, Air-conditioning, Television with international channels & DVD player, Toiletries, Terrace outside bedroom). Kitchen and Dining (Semi open-air kitchen & dining area, Fully equipped kitchen, Kitchenette). Additional Living Area 1 (Home theatre room with air-conditioning, Television with international channels & DVD player, Video game console).